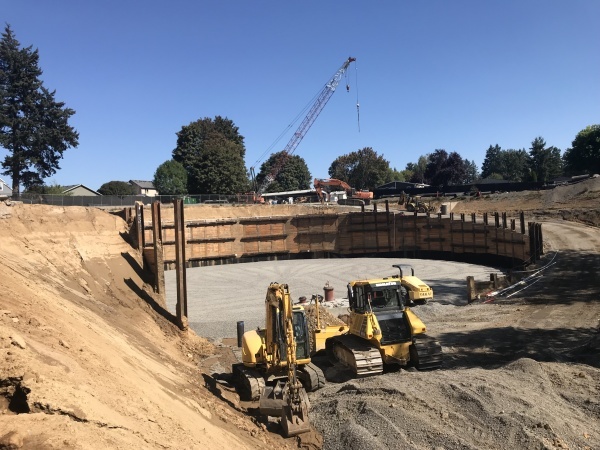 This project consisted of the construction of a partially buried 6.0 million gallon prestressed concrete reservoir, cast in place concrete valve vault structure and associated electrical/controls building of concrete masonry unit and wood-framed roof construction. Excavation, site clearing, grading and earthwork at reservoir site and adjacent utility easements. As well as furnish and install approx. 3,000 LF of Class 52 restrained ductile iron water main, connect the new water mains to the existing main lines, including transmission and reservoir site connections. Also included is paving, erosion control and other measures that were required.